Buying our first home was definitely one of the highlights of my life and five years later, it's still just as fun, for now I'm enjoying the process of decorating it, room by room! We're currently giving our living room a total overhaul and are about midway through. We still need to purchase new furniture for the living room and of course, some extra special artwork to decorate its walls. My recent quest for quality artwork led me to discover GalleryDirect.com, a fine art publisher who believes in the motto "Fine Art for Everyone!" 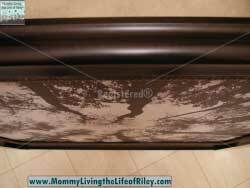 Keep reading to learn more about an online retailer who can beautify your home for less! Take 50% off Canvas Gallery Wraps and 25% off Everything Else! Sale ends Thursday (9/22) at Midnight! GalleryDirect.com is the largest limited edition fine art publisher, printmaker and artisan framer in the world. This means that they do it all: they find the artists and the artwork and they market and recreate the art themselves. There is absolutely no middleman between the artwork and your walls, which is why they can bring their customers fabulous pieces of art at prices you only dreamed of. When I discovered that I would have the fortunate opportunity to review one of their pieces of art, I was thrilled for their selection was truly astounding. The hardest part was trying to choose just one piece! I have always been a huge nature lover and so started my quest for the perfect piece of framed art for our living room with this theme in mind. GalleryDirect.com offers gorgeous landscapes and stunning organic art too, but because our living room is accented heavily in black, I thought that a black-and-white nature photograph would be just the thing we were looking for. This led me to find the breathtaking photography of artist Michael Joseph and select the piece "Standing High". Michael Joseph has been praised for his photographic achievement in presenting style and grace within the landscape of concrete and steel. In his work, lines, shapes, and shadows converge, depicting urban images like the Brooklyn Bridge, Central Park, and Wall Street. He uses a careful blend of creativity and precision which have been compared to images of Constructivism and Bauhaus. His photographs can be found in the Santa Barbara Museum of Art, the Bass Museum of Art, in corporate collections including Royal Caribbean Cruise Line and H. Lee Moffit Cancer Center, and the private collections of Tony Bennett and Rudolph Giuliani. Our limited editions are exclusive, part of a series of 950 prints. Each signed and numbered image is recreated from the original source material. We're a little different than a traditional fine art publisher insofar as we also give our clients full customization features normally reserved for the interior design trade. The chances of you seeing this image customized to your specifications anywhere else in the world is unlikely. So not only can I get a top-notch piece of artwork to hang on my walls, it will also be uniquely mine through the high-end customizations available to me! First, I had to decide which particular medium I wanted the "Standing High" photograph to be reproduced on. 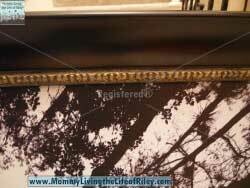 GalleryDirect.com currently offers the following options: Canvas, Paper, Aluminum, Acrylic, Mirror and Wood. For my particular needs, I thought that a framed canvas would look the best. Next, it was time to decide the size. Since this artwork would be hanging on the main wall in our living room, over our couch, I wanted the size to be large, so that it would really make a statement. 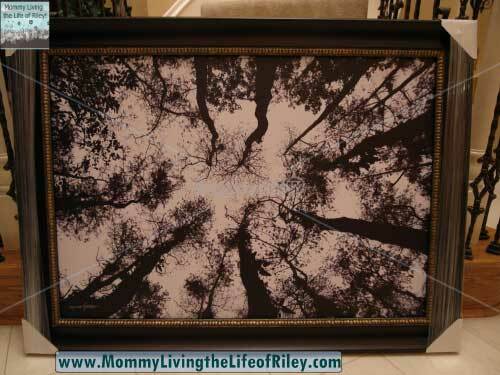 I chose the large size, which measures 40" x 28" on the inside of the frame. Finally, I needed to choose which frame option I wanted. I had the choice of gallery wrapping, floater frame or framed canvas and since our living room will have sort of an old-world feel (eventually), I decided to select a typical frame. This is where I was once again extremely impressed. GalleryDirect.com had several gorgeous frames to choose from, and the instant preview feature on the website allowed me to immediately see what my particular artwork would look like in each frame. This was very helpful and made me realize that the 3.5" Natural Very Dark Brown Frame with Pewter Lip was the only frame for me! I was also pleased to discover that all artwork from GalleryDirect.com comes with the hanging hardware already installed, so that it is ready to go straight from the shipping carton to your wall. Once the ordering process was over, I figured I would have to sit and wait several weeks before receiving my one-of-a-kind artwork, but boy was I WAY off. I actually received my artwork via Fed Ex two days later! I never dreamed it would arrive so fast and although it may have seemed like a rush job delivery-wise, this was definitely not the case quality-wise. 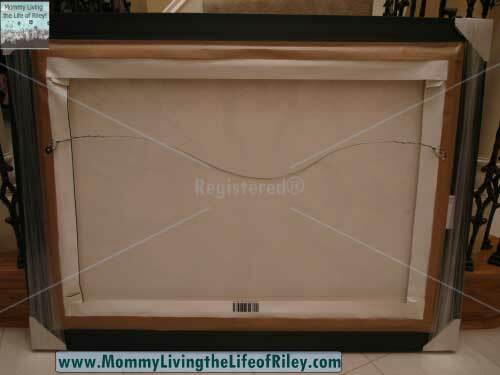 The canvas was perfect in every way, down to the extreme care that was taken in framing it and even packing it. There was not one singular, solitary flaw that I could find ANYWHERE, either on the print itself or on the frame. Now that's impressive! If you're wondering why I still have my artwork partially wrapped up and not hanging on my living room wall, it's because we haven't purchased our dream furniture just yet. I want to make sure this piece of artwork is hung in just the right spot on our wall when the time comes. I couldn't be happier with the entire experience I had with GalleryDirect.com. Their online art selection was extensive and fun to shop, their art customization and framing options were wonderful and the service was above and beyond what was expected. If you are looking for the perfect piece of artwork to grace your home's walls, then by all means, go to GalleryDirect.com and find your affordable masterpiece today! 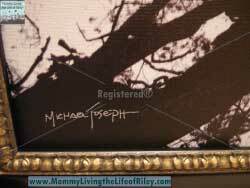 Disclosure: I received the Standing High by Michael Joseph Framed Canvas Wall Art from GalleryDirect.com in order to facilitate my review. No other compensation was received. This product review is based on my own personal experiences with this item and is completely honest and objective.